Applied behavior analysis (ABA) is a science that involves applying interventions based on the principles of behavior analysis to change socially significant behavior. ABA is often erroneously viewed as an intervention, as opposed to a science. In this chapter, we discuss the science of ABA using the framework of the seven defining characteristics of the science, as described by Baer, Wolf, and Risley. We also provide a historical account of the science, focusing on its foundation in experimental analysis of behavior. As we discuss the defining features of ABA, we also identify some of the common misconceptions about ABA and attempt to clarify so as to dispel these misconceptions. Finally, given that therapies based on the principles of behavior analysis are the crux of evidence-based treatment for autism, we discuss the role of practicing behavior analysts in the treatment team. Because behavior analysis is a relatively young field, and there has recently been very large growth in the number of behavior analytic practitioners, known as Board Certified Behavior Analysts (BCBAs). We provide information on what a BCBA is, what their training consists of, and what skills they bring to the treatment team. 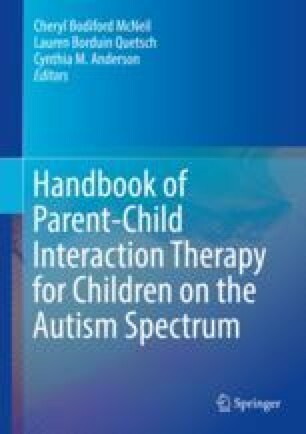 It is our hope that this will assist the practitioner of parent–child interaction therapy (PCIT) in determining how behavior analysts can collaborate with them in the treatment process.